Japan to be given up by foreign workers? 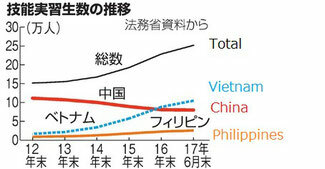 Japan is not the only country facing labor shortage, but all the developed ones. Judging from my research on the foreign caregivers, the following conditions are international standard to accept foreign labors. Japan has ignored these conditions so that it should be defeated by other countries how much Japan may expect on the foreign labor. In the near future, Japan will be given up by the possible foreign workers, especially those who can manage English, as a substandard country for the contract labor.